IS it mere nostalgia that causes me to crave the old tackle; the rods, reels and accoutrements of my youth? Or is it that I imagine vanished qualities in the equipment of yesteryear, - qualities that may be lacking in the best contemporary gear and techniques? No doubt, the old-time carp fishers such as Richard Walker and Jack Hilton knew a thing or two when it came to tackle for close-range action. This is probably because these pioneers targeted small to medium-sized waters such as Woldale, Ashlea and Redmire, where mighty casts were not required. Most modern carp rods, it appears, are designed for one task and one task only: to sling a heavy semi-fixed bolt rig to the far horizon and await events, usually from the comfort of a tent. As for modern methods: I have used the hair-rig and the bolt rig on many occasions; but this approach to fishing still feels like cheating to me, to some extent, because the bait is attached to the hook by a fine “hair” and is not on the hook itself. The idea is, of course, is that the fish will take the attached bait without suspicion and, should it try to blow the bait out, it will prick itself on a bare hook that followed after the bait, into the mouth, as if by devilish magic. The carp then panics for a “run” one simply cannot miss. If the bare hook fails to prick the fish, the weight of the heavy lead used for a bolt-rig can jolt it home, as a further refinement of the trap. There is usually no need to strike. Such arrangements entrap fish, without human judgement at the moment of the take; whereas stalking is a sporting art to the highest degree. Am I alone in thinking that distinctions should be made in the record books between a fish that is struck by the angler and a fish that hooks itself, and also between a fish that is fooled by a hair-rigged bait and one that falls to a traditionally baited hook? Perhaps I am just being old-fashioned, for it is true that many useful approaches, such as zig-rigging - the suspension of a bait some distance above the bottom, from the bottom, - simply will not work properly unless a hard or spongy bait is hair-rigged; unless. of course, the bait is bread. However, many more senior anglers will recall the aura that still surrounded carp in the mid to late Seventies, when I was a carp-mad schoolboy. Walker’s record - the magnificent bread-caught 44lb Clarissa - had stood for over twenty years and the target seemed unassailable. The aim then was catch a carp - any carp, and it wasn’t easy, especially for someone who grew up with the still industrial Black Country on his doorstep. There were no overstocked commercial fisheries in those days. As I have related, it was an industrial canal that gave me my first glimpse of carp. Looking back, I suppose that only six or seven fish lived in a stretch beneath the Stuart’s glassworks cone, near Stourbridge. Both young and old anglers alike spoke in quiet, humble tones whenever the Stuart’s carp were mentioned, because it was generally accepted that they were uncatchable. I now know - because the late great John Sidley, just a few years before his death, imparted the information to my brother David - that these carp were Leney’s: the same strain as the Redmire monsters. They had been stocked into several canal reservoirs just a few miles away and they had obviously made their way down the canal system. Soon a proper carp rod was on my Christmas list and, at the age of thirteen, I became the proud owner of a Shakespeare Carp International. I still have it, and it still can manage double-figure fish. My fishing companion, Martin Flavell, received a 10ft Tony Fordham carp rod for his birthday. 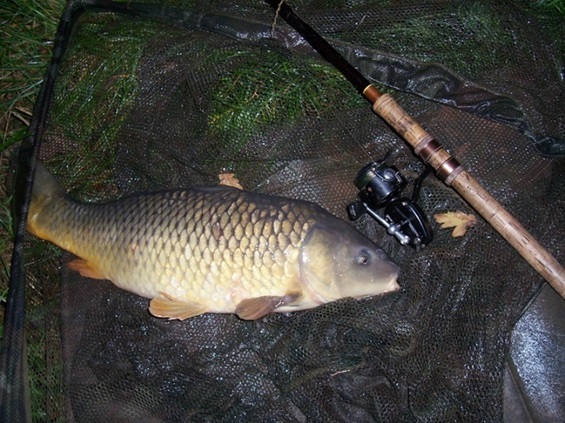 Later, another friend was to use a Browning carp rod and another companion, a Milbro Carpmaster. These were off the peg carp rods, the standard 10ft 2 inches in length, and all were purchased from local tackle shops. They also shared in common that fact that they were variants or versions of Richard Walker’s successful Mark IV design. There were subtle differences. Martin’s Fordham, for instance, had a slightly more steely action than my Carp International. I was reminded of this when I recently purchased a circa 1970 Hardy Deluxe fibreglass carp rod on eBay. I've used it, and it is a more punishing wand than the International, when dealing with a hard-fighting carp beneath one’s feet. But aside from a test curve of between 1.5lb and 2lb, all these glass rods were light in the hand. No effort was spared to make them so. The rings were usually of chrome, the handles were cork, and sliding reel fittings were standard. For instance, the Carp International weighs just 12 ounces; the Hardy, just a little over that; whereas my cane Mark IV weighs almost 1lb. When Richard Walker in Still Water Angling wrote of “ten ounces of hardened bamboo,” he must have forgotten his rings and fittings! These days, most people think of cane rods whenever the Mark IV is mentioned; but it seems to me that the fibreglass versions were the ultimate expression of Walker’s design, or is that heresy? Certainly, high-quality carbon fibre is as light, and it is stronger. I own some superb carbon fibre stalking rods by Diawa; and yet, on occasions, I prefer glass to both cane and carbon. However, whisper it softly in some quarters: there is such a thing as a classic carbon rod. My understanding is that the availability of obtaining first rate carbon for blanks is getting rather tricky, and that the finest carbon blanks were around twenty years ago, or more. My AKN 116 Stalker, (bought in 1993) is a 26 braid high modulus carbon, and it is essentially "double-walled", which leads to an exceptionally thin blank - thinner that any cane carp rod could ever be. Carbon rods are not always just "knocked off" cheaply in noisy factories: the first rate blanks are difficult and expensive to produce, in fact. Apart from the AKN 116, of which I have two, I've owned two other rods which I would term "classic carbons". For years I owned and used a Drennan Tench Float, MK 1 - taking tench on this to almost 6lbs - alas, my PB tench fell to a ledger rig, not to a float rig! 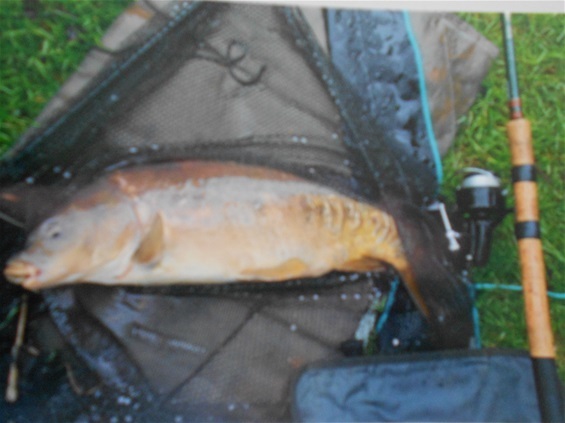 It also managed hard fighting canal carp, at close quarters, to just under 9lbs. Some anglers say this rod will easily tackle double figure carp - but other rods are probably more suitable, I'd say. It's the late 20th century version of the Wallis Avon, in my view. Another classic carbon is the John Wilson Avon/Quiver MK 1. Mine was a gift from Bryn, my dear father. I've had several double figure carp on this: I should point out that this rod comes with two tops and I'm yet to use the quiver top, which might be a little light for carping. The "Avon" top is fine - giving a test curve of 1.25lbs - a little over the test curve for the classic MK IV Walker Avon. It's a good "sight-bobbing" rod when line strength is good at 8lbs or 10lbs max. I must confess, with some carp I've felt the cork bending under my grip - but the rod seems to bear up rather well, all told. My main gripe with modern carbons is that they are mainly too heavy in the test curve for close-range carping. In short, they are casting tools for long range bolt-rigging etc, and I simply don't fish like that. Hi Ben - Ebay can be OK, but be cautious; tackle fairs are more pricey, but good. Try Mitchell reels and glass carp rods - 1.5lbs to 2lbs test curve. Best-G.
Tis Woolly Bear ere , yep i too owned a carp-master rod , through action it certainly possessed . Felt lighter than pound and half T C . K Regs WB . Hi WB! - I wonder if the spring in a lighter rod can sometimes be more telling on fish than pocker stiffness? What do you think? Hi Grazy - I think it would make a good barbel rod; of it's time, but still functional. I think Milbro blanks, if a little thick-walled, were very sound.